American author; born at Troy, N. Y., Feb. 10, 1857; educated at the Troy High School; at Williams College, from which he received the degree of M.A. ; and at the universities of Paris, Berlin, and Göttingen, receiving from the last-named the Ph.D. degree for his study on the "Gilda Mercatoria." He is also an honorary M. A. of Harvard, in which university he has held a professorship of history since 1888. 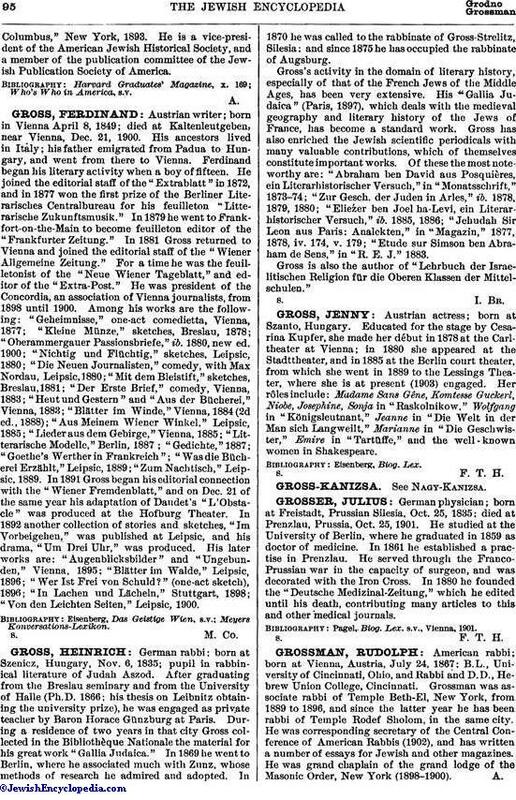 Gross has shown great originality and industry as an investigator in medieval and English history, in which field he has written the following: "Gild Merchant," 2 vols., 1890; "Select Cases from the Coroners' Rolls," 1896 (for the Selden Society); "Bibliography of British Municipal History," 1897; "Sources and Literature of English History," 1900; "The Early History of the Ballot in England," in "Political Science Quarterly," 1898; "Modes of Trial in the Medieval Boroughs of England" (Harvard Law Series, May, 1902). 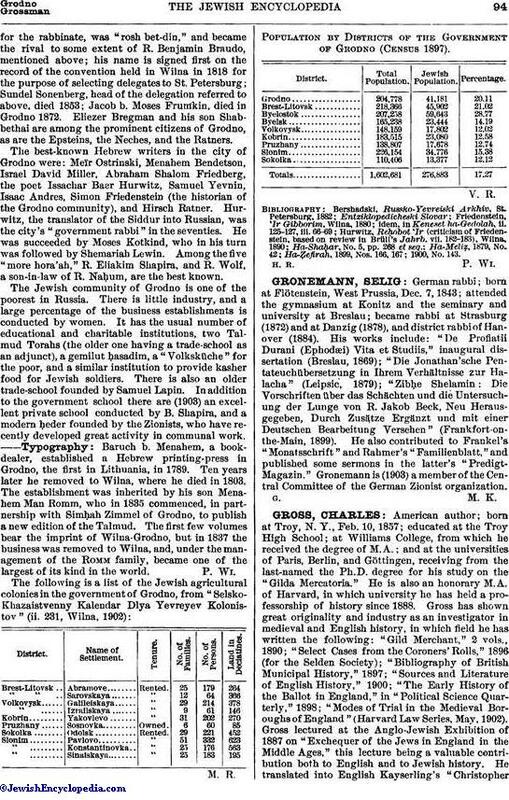 Gross lectured at the Anglo-Jewish Exhibition of 1887 on "Exchequer of the Jews in England in the Middle Ages," this lecture being a valuable contribution both to English and to Jewish history. He translated into English Kayserling's "ChristopherColumbus," New York, 1893. He is a vice-president of the American Jewish Historical Society, and a member of the publication committee of the Jewish Publication Society of America. Who's Who in America, s.v.